Why do you want to learn the martial arts? If you’re like most people, sure, you want to get a great workout. But you want so much more…you want to learn iron-clad self-defense skills for the real world—because in the real world, losing a fight can mean losing your life! When you enroll in the Carlson Gracie Brazilian Jiu-Jitsu program at Roufusport Mixed Martial Arts Academy, you’ll discover why Jiu-Jitsu is the fastest-growing martial arts program in the world today! 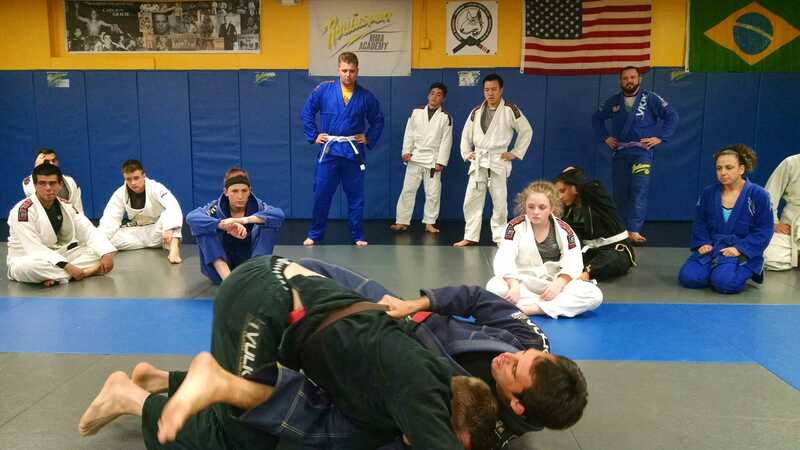 Best known for its effective ground-fighting techniques, submission holds and grappling, Brazilian Jiu-Jitsu (“BJJ”) is serious self-defense, and a serious wrokout! Roufusport’s certified Carlson Gracie 3rd Degree Black Belt Jiu-Jitsu instructor Daniel Wanderley has traveled the world gaining knowledge and experience to properly teach our students basic Jiu-Jitsu and Grappling fundamentals through intermediate and advanced techniques. Our Grappling & Jiu-Jitsu classes also provide great personal protection and self-defense techniques to help you safely traverse today’s ever changing and sometime’s dangerous society. Roufusport offers a combination of Carlson Gracie Jiu-Jitsu, Grappling and specialized Wrestling training sessions 6 days-a-week for adults. Roufusport also offers the Carlson Gracie Kids Brazilian Jiu-Jitsu program for children as young as 4 Monday-Thursday from 5:00-6:00 pm. Beginner To Advanced Level Jiu-Jitsu Classes Available. Start Anytime. To learn more about these incredible Jiu-Jitsu classes in the Milwaukee Wauwatosa area, just complete the short contact form on this page. A helpful Roufusport staff member will contact you so you can get started in the Roufusport Jiu-Jitsu & Grappling program today with a FREE class! Click HERE to get started now with Roufusport’s $19.99 Five Class Jiu-Jitsu & Grappling Trial Special including FREE Roufusport Shirt ($25 Value) or try our $29.99 Five Class All Inclusive Trial Special, which includes all Jiu-Jitsu program classes, and receive a FREE pair of Boxing Gloves ($40 value).